Black AYN License Frame and Module - AdventureTech, LLC. 12 volts DC and only draws half an amp. The default mode that your AYN frame has is MODE A. If you would like to switch to any of the 4 braking flash patterns, simply press your hand or foot brakes the amount of times listed below ( 6x, 9x, 12x or 15x) immediately after you turn on your motorcycle. You will need to wait 10 seconds for the mode you've chosen to take effect. Mode A - (Default)1 second rapid WIG WAG (back-forth on either side) then our patented BackOFF sequence (Three slow flashes - Steady for one second - Repeat).To engage: Press your hand or foot brake 6x immediately after you turn on your motorcycle. You will need to wait 10 seconds for this mode to take effect. Mode B - 1 second rapid WIG WAG (back-forth on either side) then your brakes will remain steady on as long as you are stopped. To engage: Press your hand or foot brake 9x immediately after you turn on your motorcycle. You will need to wait 10 seconds for this mode to take effect. Mode C - Steady on brakes (NO flashing) - This mode will most commonly be needed in the event that your state has a mandatory annual vehicle inspection or during group rides. To engage: Press your hand or foot brake 12x immediately after you turn on your motorcycle. You will need to wait 10 seconds for this mode to take effect. Mode D - Continuous rapid WIG WAG (back-forth on either side) as long as you are stopped. To engage: Press your hand or foot brake 15x immediately after you turn on your motorcycle. You will need to wait 10 seconds for this mode to take effect. HAZARD MODE - Turn your right turn signal on, apply your hand or foot brakes and turn your key switch off. When the hazard mode is turned on this way it will continue to flash until your motorcycle is turned back on. This mode will not work while your motorcycle is on for safety reasons. 'NIGHT RIDER' MODE - Turn your left turn signal on, apply your hand or foot brakes and turn your key switch off. When you engage 'Night Rider' mode the LEDs will sequence continually back and forth until you turn your key switch back on. The main use for this mode is to show off your frame and bring more attention to your motorcycle during bike nights or rally's. This mode will not work while your motorcycle is on for safety reasons. TURN SIGNALS - The frame will give you additional turn signals that sequence from the center and outward for increased visibility while changing lanes or waiting to turn. To install, nest your license plate into your license plate frame, continue by checking to see that the 4 mounting holes all align correctly. The use of a round metal file may be necessary to ensure alignment prior to installation, if adjustment with a file is necessary minimal filing is required. It is recommended during installation not to pinch the wires against the sharp edge of your license plate, as this can cause the wire(s) to shred from vibration causing the LED light bar to lose functionality. Some license plates may need to be 'notched' for the wires to remain undamaged. 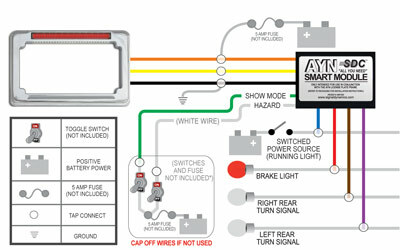 The LED license plate frame has 3 wires in total. To ensure proper orientation, mount the license plate frame with the light bar on top and follow the wire color code below. 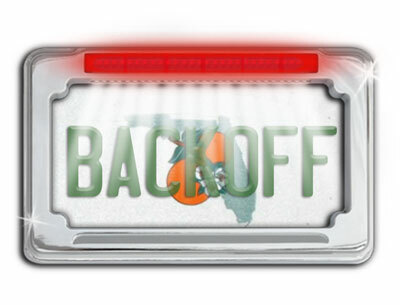 If you choose to mount the plate with the LED light bar on the bottom, reverse the wire colors and connect the purple wire to your right turn signal and connect brown to your left turn signal.